Executable specification model for the image processing algorithm used for early verification, with input image (top left), floating-point result (top right), and fixed-point result (bottom right). A design and application technology company of Renesas Electronics, Renesas System Design develops ASICs, large-scale integration (LSI) systems, and microcomputers, as well as core technologies for electronics products. Among these core technologies are the advanced image processing and filtering algorithms used in automotive display systems and digital imaging equipment. To accelerate the design and implementation of image processing intellectual property (IP) core for ASICs, Renesas engineers adopted Model-Based Design with MATLAB® and Simulink®. In their previous workflow, Renesas engineers verified early versions of the image processing algorithms on still images. When those algorithms were implemented in HDL and tested on a video stream, the team identified problems with the algorithm that the still image tests had not revealed. Making the required changes at that late stage was difficult, and left no time in the schedule for implementing and testing the updates. Renesas engineers wrote a floating-point version of their algorithm in C. To convert the floating-point code to fixed point, Renesas relied on a few experienced engineers who understood the algorithms and were familiar with register transfer level (RTL) hardware design. Reliance on a small number of engineers for time-consuming yet vital tasks caused project bottlenecks. HDL code was written by hand based on the fixed-point C code, causing additional delay. Renesas needed a development approach that would enable them to complete real-time verification of their algorithms early in development. They also sought to minimize bottlenecks associated with converting from floating point to fixed point and with writing HDL code. Renesas engineers adopted Model-Based Design for image processing algorithm development and implementation. Working in MATLAB and Simulink, the engineers developed a floating-point model of the image processing system based on the specification. They performed early functional verification of the model by visualizing the effect of the image processing algorithm using output images produced via simulation. The team used Computer Vision Toolbox™ to visualize output images from the system model. With Fixed-Point Designer™, they converted the floating-point design to fixed point. The Fixed-Point Advisor tool in Fixed-Point Designer enabled them to automate steps in the conversion and to detect overflow and underflow conditions. After comparing simulation results from the fixed-point and floating-point versions, the team used HDL Coder™ to generate synthesizable HDL code from their optimized Simulink model. 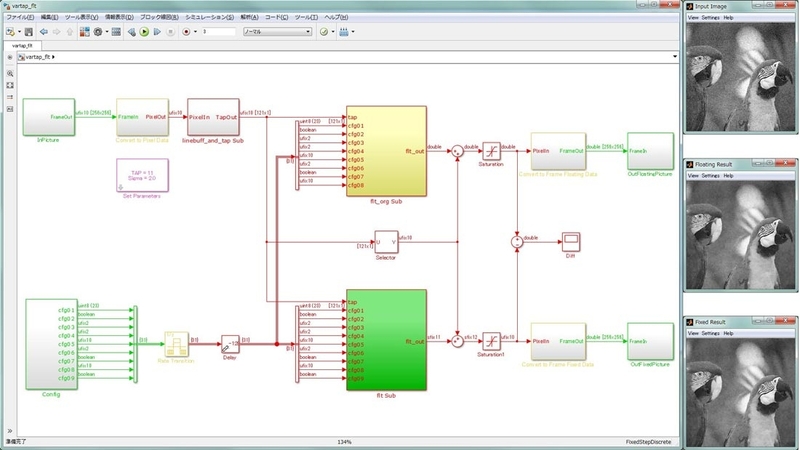 Using HDL Coder and HDL Verifier™, the team generated a test bench, which they used to verify the HDL via cosimulation with Simulink and Cadence® Incisive®. They optimized the design for speed and area to meet the specification using a MATLAB script. This script generates multiple versions of the code using a range of HDL Coder resource sharing factors and pipelining options and synthesizes each version of the code with Synopsys® Design Compiler. The team then compared the synthesis results to identify the optimal design. They deployed the synthesized code to a Stratix® FPGA from Altera (now part of Intel) for prototype testing, and then synthesized the IP core for ASICs with HDL code that was generated from the same Simulink model. Renesas engineers have completed development of the image processing system using Simulink and HDL Coder, and plan to use Model-Based Design on future image processing technology projects.